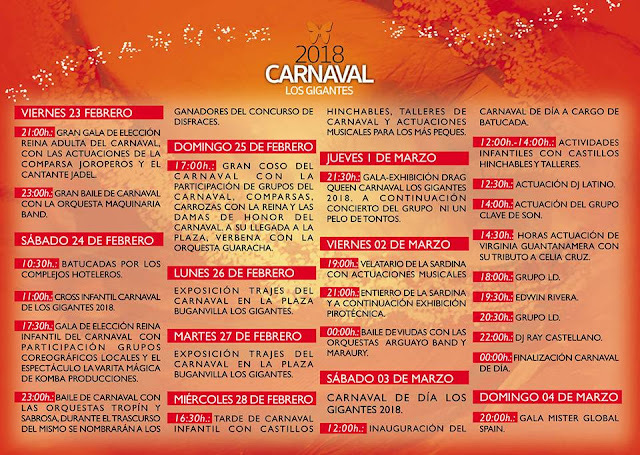 DUE TO BAD WEATHER events were suspended by the organisers and the carnival programme in Los Gigantes had to be revised. Details of the new dates and events. 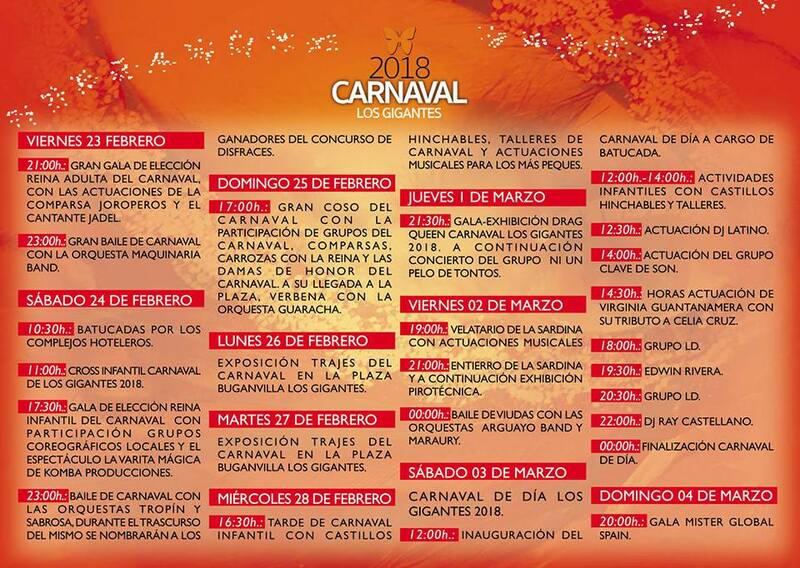 Confirmation of the dates of Carnival in Los Gigantes in 2018, which runs from Friday, 23 February to Sunday, 4 March, as you will see from the Carnival Programme above. 9pm Grand Gala for the election of the Adult Carnival Queen with performance by Comparsa Los Joroperos and singer, Jadel. 11pm Carnival Dance with Orchestra Maquinaria Band. 5:30pm Gala Election of the Junior Carnival Queen with the participation of local coreographic groups and magic show. 11pm Carnival dance with Orchestras Tropin and Sabrosa, during which the winners of the costume contest will be announced. 5pm Grand Carnival Parade with the participation of all the carnival groups; comparsas, floats with the carnival queens and her maids of honour, etc. Upon the procession's arrival in the square, dancing to the Orchestra Guaracha. Exhibition of carnival costumes in the Plaza Buganvilla in Los Gigantes. 4:30pm Carnival afternoon with bouncy castles, workshops and musical performances for young children. 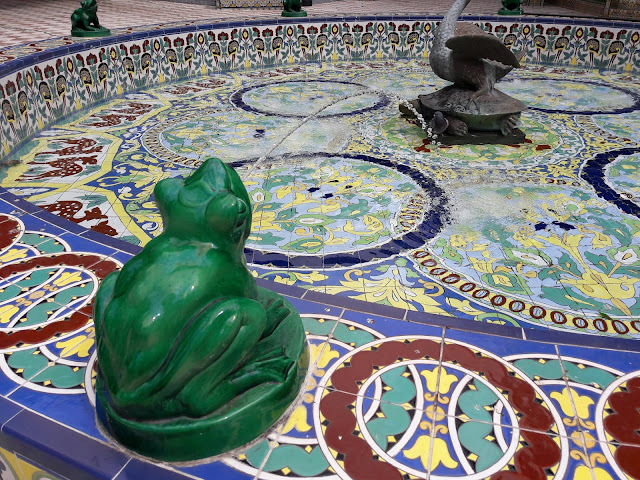 9:30pm Drag Queen Gala-Exhibition followed by concert by group "Ni Un Pelo de Tontos". 7pm Velatorio - a traditional meeting or celebration of the relatives and friends of a deceased person in the hours following his death, and before the burial or cremation of the corpse - for the Sardine with musical performances. 9pm Burial (actually, it will be a cremation) of the Sardine, followed by a fireworks display. Midnight Widows' Ball with Orchestras Arguayo Band and Maraury. 12pm Inauguration of the Daytime Carnival with the batucada. 12pm - 2pm Kids' activities with bouncy castles and workshops. 12:30pm Performance by DJ Latino. 2pm Performance by group Clave de Son. 2:30pm Virginia Guantanamera with a tribute to Celia Cruz.